Hey everyone! Remember how I made soap back in August? Well, it has been done for some time and sitting on top of a dresser. I wasn’t sure I was happy with it. The soap smelled kind of stale, to be honest, and had a fine layer of crud on top from curing outside. See, a day or so after making the soap our house started to smell like mothballs. We were afraid that it may have had something to do with the lye, so we cured the soap outside. (In hindsight we think the smell might have been coming from a neighbor’s apartment.) My soft soap collected a layer of dirt and grime while sitting in its bread pan. Between the smell and the crud I wan’t too eager to post it on the blog. But the show must go on. This morning I took the top layer off of each bar with a vegetable slicer and they were good as new. Then I tested one to see how it lathered and it worked great! I was impressed. The smell isn’t good, but it didn’t leave a bad smell on my hands so I think they’re usable. – Safety is key when working with lye, but it isn’t so difficult that one shouldn’t try it. Soapmaking was easier than I expected. – A stick blender is absolutely the right tool for emulsifying the liquid soap. Worked like a charm. 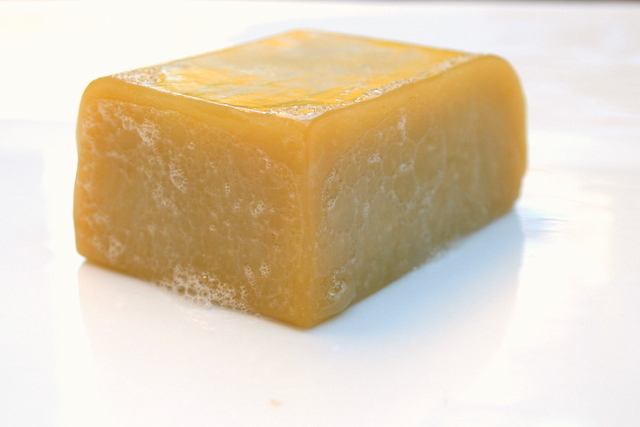 – Trying soapmaking a few times to test smells and shapes would be a fun thing to do. Watch for more updates this weekend and a new project starting Monday!